This month’s focus is on two different stories, but both involving the same spacecraft: Kepler. Edward Gomez and I discuss a result from the outer edge of our Solar System, regarding the icy world that goes by the catchy name of “2007 OR10”. 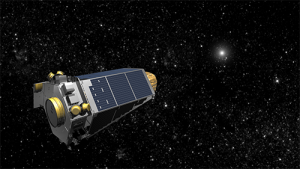 By combining information from the Kepler Spacecraft, now in the second phase of its mission with a partially-functioning spacecraft, with results from the Herschel Space Observatory, astronomers have made a new estimate of its size. But Kepler’s main mission was to search for planets around other stars, and that’s what the other notable result this month involves. Through a careful analysis of data, the Kepler team have identified over 1000 objects that are probably planets. I spoke to Professor Don Pollacco from the University of Warwick, about what this result means, and its impact on future space missions such as ESA’s Plato spacecraft. Originally broadcast on 26th May 2016 as part of Pythagoras’ Trousers on Radio Cardiff.